The famous Split Rock at West Harbour Bluff. A very beautiful area with many interesting features, but the isolation and associated crime risk should be considered. The beach at West Harbour Bluff. West Harbour Bluff is a protected site. It is illegal to cause any damage or inscribe graffiti to any rock surface in the area. Please take great care to not walk on the rock inscriptions. Fishing and the collection of any marine product is prohibited. West Harbour Bluff (also known as Split Rock or Pirate's Cove) is a scenic area at the southwest point of Providenciales. This coastal setting offers several interesting features, including a small peninsula with sea cliffs, a small open faced cave, and about a mile of secluded beach. The West Harbour Bluff area is one of the more remote sections of Providenciales, and about a five mile drive from any developed part of the island. The view from the top of the peninsula is quite impressive. 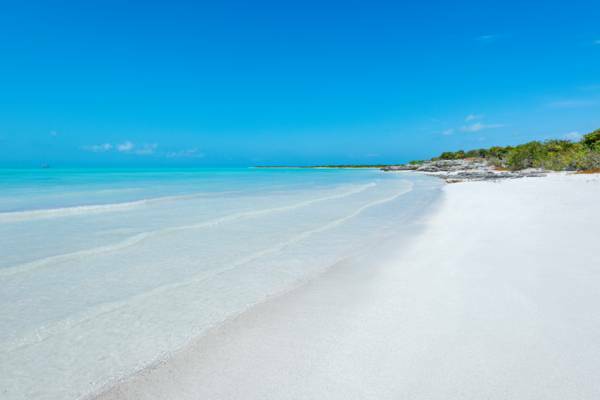 To the north, the beaches and shallows of the Frenchman’s Creek Nature Reserve can be seen, and to the southwest, West Caicos. If you’re lucky, you may spot a shark in the water below, or find one of the 200 year-old inscriptions left in the rock by past shipwrecked sailors. The West Harbour Bluff area is part of the Frenchman’s Creek Nature Reserve, which continues north along the coast of Providenciales for about three miles. 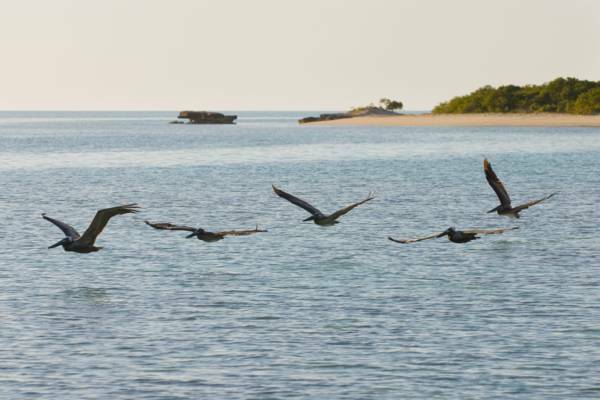 For bird watchers, this region is frequented by Brown Pelicans, White Tailed Tropic Birds, Ospreys and Green Herons. Bonefish Point, a scenic sandy peninsula, is also found near West Harbour Bluff. West Harbour Bluff is part of the Frenchman’s Creek and Pigeon Pond Nature Reserve and the area is great for birdwatching. The West Harbour Bluff area supports an interesting menagerie of wildlife. 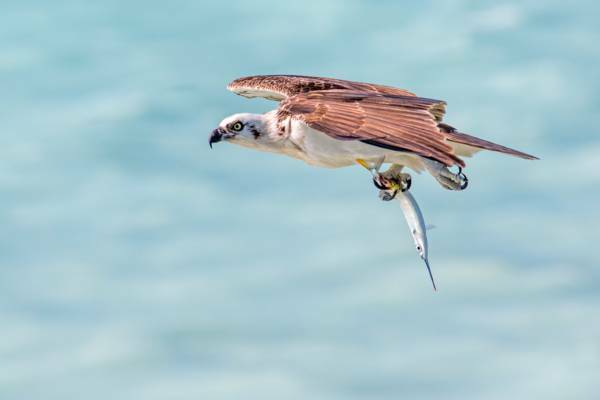 Majestic ospreys nest in the area, brown pelicans and tropic birds often glide by, and schooling fish, stingrays, small sharks, and starfish can be seen in the water surrounding the cliffs. Osprey with ballyhoo fish off West Harbour Bluff. One of the aspects of West Harbour Bluff is that you’ll never know what you may see. As an outlying and unusual terrain on Providenciales, the peninsula here provides shelter to fish and birds, especially during abnormal weather conditions. West Harbour Bluff and the adjacent Frenchman’s Creek Nature Reserve supports large populations of the brown pelican, which can often be seen flying in flocks. The West Harbour Bluff area of Providenciales is remote, so crime is a concern. See our article on Safety and Crime for more information. 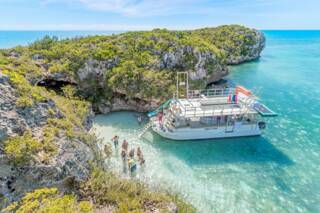 Due to the limestone makeup of the location, holes and small caves abound. Beware as these are often hidden in the vegetation and can be deep. The poisonous coral sumac tree and manchineel tree are common to the coastal area of West Harbour Bluff, and may cause skin blisters and irritation. Avoid touching these plants. 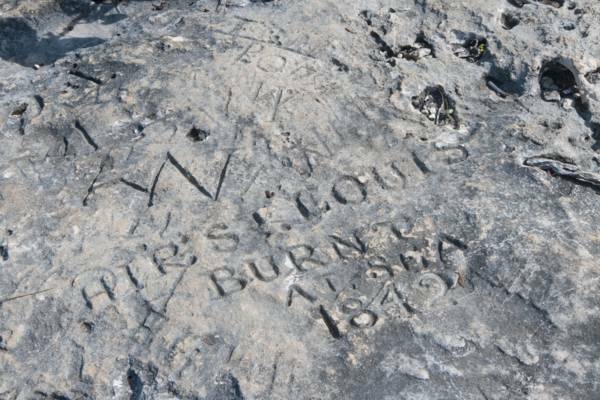 Rock carving commemorating the ship St. Louis, burnt at sea in 1842. Records from the time suggest that the St. Louis was sailing from Boston to New Orleans, so it’s a bit of a mystery how this ship met its fate off of Providenciales. To get to West Harbour Bluff, follow Millennium Highway from town for about three miles and then turn left on Tom Lightbourne Road (paved for about one mile). If you’re on the right road, you should get to West Harbour Bluff after six and a half miles. After a few miles, this road gets rough in places, so prepare to go slow. Be sure to bring plenty of drinking water with you when you visit the area, as it’s a long drive back out. An alternative to driving to West Harbour Bluff is to get there by sea. A local boat tour operator offers a weekly scheduled boat excursion to West Harbour Bluff from central Providenciales. Guided ATV and dune buggy tours are also offered to the area. West Harbour Bluff and much of the surrounding regions are part of the Frenchmans Creek and Pigeon Pond Nature Reserve or the Chalk Sound National Park. Stay on the roads. It is illegal to drive on the beach, in the wetlands, or on the salt flats. Significant fines are applicable. Cave at West Harbour Bluff. 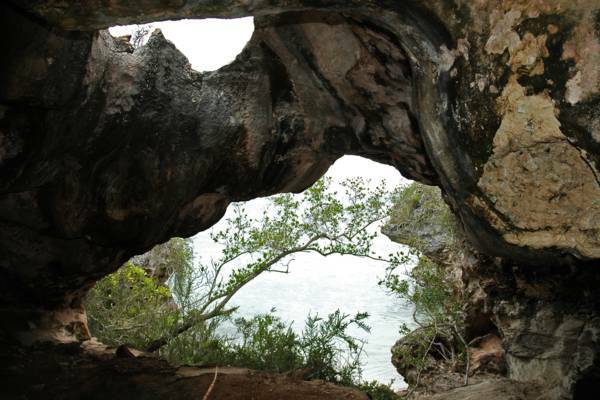 A popular spot to explore today, several ancient Lucayan Indian artifact fragments were fund in this cave in 1912 by anthropologist and explorer Theodore de Booy. Ocean Outbacks offers a fun boat charter adventure that visits West Harbour Bluff, Pirate's Cave, Bonefish Point, and more. See incredible wildlife, historical rock inscriptions, and secluded coasts. Last reviewed by an editor on 31 December 2018.